Channel drainage, also known as linear drainage, is a popular choice because it is simple to design and install. 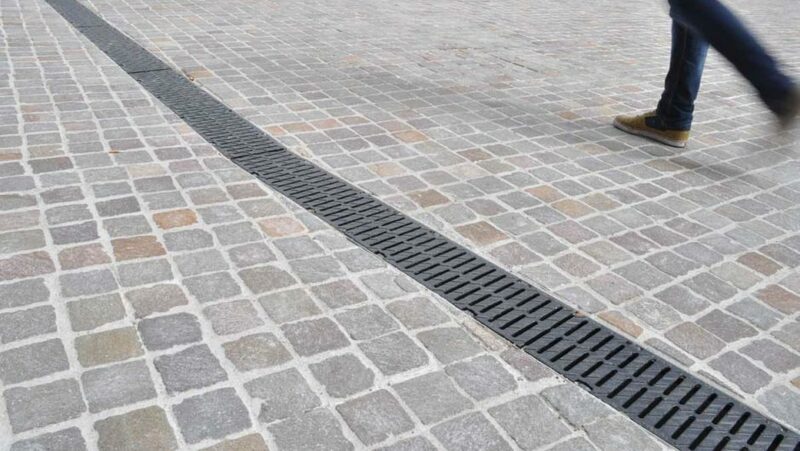 It is also a cheaper option for surface water drainage than a typical point water drainage system and aesthetically, can be discreet, or a design statement – the choice is yours. Channel drains typically consist of a channel and a removable grate. You may also need sumps, end caps and other accessories. One other type of channel drain is the slot drain. This is the most discrete form of channel drain, great for paved over areas. Grates are easy to remove with keys, bolts or locking systems giving you full access to the channel below. Sumps (if needed), have easy to remove buckets and slot drains have access units, easily accessed with lifting keys. Channel drainage can be discrete or part of the design – it’s up to you. There are three key things that will determine the type of channel drainage you need. Capacity – how much water does your channel drain system need to cope with? Loading – how much weight is going to be placed on your channel drains? Aesthetics – what do you want your channel drainage to look like? 1. Choose the depth of channel you require for the expected flow of drainage water. Depths range from 50mm (34cm² hydraul.section) to 650mm (1,380cm² hydraul. section). 2. Choose your load class rating. 3. Choose your grating (loading will play a part in what is available for you). ULMA provides a superior system, capable of suiting any aspect of your channel drainage needs. With a vast range of sizes and load classes, Drainfast is proud to be a major UK stockist of the complete ULMA catalogue. Rely on Drainfast’s excellent customer service to help your project run smoothly.